8mm guaranteed overnight… unlike the forecast rain. It is raining buckets here. We got some rain - but nothing like the amount predicted. Cooler though, which is welcome. Love this one! The contrast of the equipment to the sky is fabulous. I wish I could send you some of our Scottish rain! We've had record amounts this year. It's definitely more reliable than the weather forecast! I guess you can always hope that pretty blue sky will bring you some additional showers. Very well composed. (as always!) Love the light. Neat shot- you have a wonderful eye for composition. I'm not sure what this is, but it's really huge. Lovely image. It is a lateral move overhead spray irrigator. It moves up and down the paddock in a line, watering the paddock as it goes. 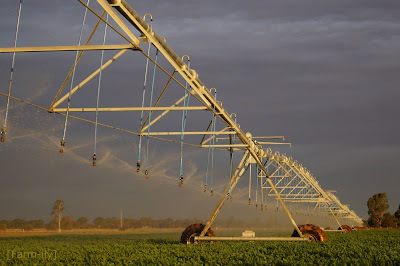 Our rainfall out here is quite low, so we rely on irrigation to grow summer crops.